I remember with crystal clarity the moment my research mentor Dr Elaine Hall uttered the words that have come to change my life. We were stood in the corridor outside our offices – where all the best conversations take place. Reflecting on my inclination towards narrative and storytelling, Elaine said to me, “you might like autoethnography”. No truer words have been spoken. One of the most widely-cited definitions of autoethnography is: “a form of self-narrative that places the self within a social context”. (Reed-Danahay, 1997). Ellis, Adams & Bochner (2011) build on this by delving into etymology. For them, autoethnography is “an approach to research and writing that seeks to describe and systematically analyze (graphy) personal experience (auto) in order to understand cultural experience (ethnos)”. Many writers use a combination of these statements when attempting to explain what autoethnography is. For me, to get to the heart of a methodological approach you have to explore its history. So for autoethnography we need go back to the 1980s, where the commonly accepted position was that the researcher should strive for facts, truth, generalisability, and objectivity. The researcher’s voice was viewed as contaminant; it must not be allowed to poison the text. During this period, a group of researchers began to speak openly about their unease with these ‘rules’. Rebelling against the notion that “a text is important only to the extent it moves beyond the personal” (Ellis & Bochner, 2000, p746), they called for interpretive, emotional, narrative research which focussed on the researcher’s own experience. Autoethnography, as that research has since become known, offers the researcher the opportunity to evaluate their culture, identity and personal history through the telling of stories. For the past 18 months I’ve been immersed in autoethnography. I’ve read hundreds of articles, spoken at the 2nd British Autoethnography Conference, and, to the eternal bemusement of my family, requested a long list of autoethnographic texts for birthday and Christmas presents. Primarily, I have argued for more autoethnography in educational research, particularly higher education where my interests lie. Whilst higher education is an “increasingly popular” (Doloriert & Sambrook, 2009, p29) topic for autoethnographers, it’s rare to find autoethnographic exploration of the day to day realities of teaching (notable exceptions being Sparkes, 2007 and Ellis, 2011). I want to see rich, deep narratives about our identities as teachers and the culture within which we find ourselves. I want to see hidden worlds exposed so that others can enter that realm and “use what they learn there to reflect on, understand, and cope with their own life” (Ellis, 2004, p46). Above all, I want to utilise autoethnography so I can offer a deeper insight into my teaching function; how I build connections with my students, my responses to students of varying abilities and needs, my pastoral mentoring role, and the characters I adopt for different educational scenarios. 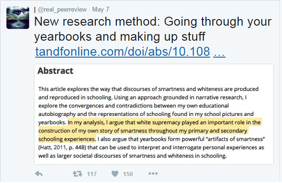 So why do so few educational researchers explore autoethnography? Autoethnography has its critics. Delamont, for example, has published numerous articles in which she maintains that autoethnography is (a) an exercise in self-obsession and (b) ethically questionable (Delamont, 2007, 2009, 2012). I personally enjoy wrestling with Delamont’s criticism of autoethnography. And in my first two publications on autoethnography, I seek answers to my own questions about narcissism, and the ethics of writing about others (Campbell, 2016; Campbell, in press). Engaging in discussion is part of academic life, and if I am to be an autoethnographer I must be able to articulate why my chosen methodology works for me. However, the tweets above do not invite debate. They slap you down. They laugh at your apparent lack of scholarly prowess, or (as some tweets have said) ‘idiocy’. At times, they go beyond mere sniffiness, and enter the realm of bullying. 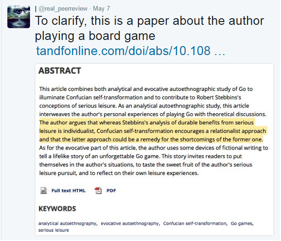 Autoethnography is not without its problems, but don’t we want to encourage the critical exploration of emerging methodologies? Those new to research, such as myself, should be encouraged to expand their horizons and, if they wish, take a step outside of traditional frameworks. That step might not, in the end, be for everyone. But if it appeals to you, you deserve better than to be treated with condescending disdain. Campbell, E. (2016). Exploring Autoethnography as a Method and Methodology in Legal Education Research. Asian Journal of Legal Education, 3(1), 95-105. Campbell, E. (in press). Should I Share My Journal Entry With You? A Critical Exploration of Relational Ethics in Autoethnography. Departures in Critical Qualitative Research. Delamont, S. (2007). Arguments against Auto-Ethnography. Qualitative Researcher. 4 Retrieved 10 May 2016 from http://www.cardiff.ac.uk/socsi/qualiti/QualitativeResearcher/QR_Issue4_Feb07.pdf. Delamont, S. (2009). The only honest thing: autoethnography, reflexivity and small crises in fieldwork. Ethnography and Education, 4(1), 51-63. Delamont, S. (2012). Autobiography: tales of the writing self. In S. Delamont (Ed. ), Handbook of Qualitative Research in Education (pp. 542-549). Cheltenham: Edward Elgar Publishing Limited. Doloriert, C., & Sambrook, S. (2009). Ethical confessions of the “I” of autoethnography: the student’s dilemma. Qualitative Research in Organizations and Management: An International Journal, 4(1), 27-45. Ellis, C. (2011). Jumping On and Off the Runaway Train of Success: Stress and Committed Intensity of an Academic Life. Symbolic Interaction, 34(2), 158-172. Ellis, C., Adams, T. E., & Bochner, A. P. (2011). Autoethnography: An Overview. Forum: Qualitative Social Research, 12(1). Retrieved 10 May 2016 from http://www.qualitative-research.net/index.php/fqs/article/view/1589/3095. Ellis, C. S., & Bochner, A. (2000). Autoethnography, Personal Narrative, Reflexivity: Researcher as Subject. In N. Denzin & Y. Lincoln (Eds. ), The Handbook of Qualitative Research (pp. 733-768): Sage. Reed-Danahay, D. (1997). Auto/Ethnography: Rewriting the Self and the Social: Oxford: Berg Publishers. Sparkes, A. C. (2007). Embodiment, academics, and the audit culture: A story seeking consideration. Qualitative Research in Organizations and Management: An International Journal, 7(4), 521-550. Elaine Campbell was recently named Law Teacher of the Year at the Northern Law Awards 2016. Elaine is an experiential educator, supervising law students who provide free legal advice to members of the public through Northumbria Law School’s Queen’s Award winning Student Law Office. 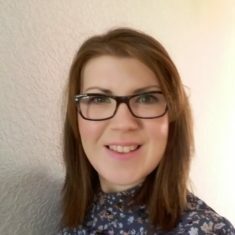 A member of Northumbria’s Legal Education & Professional Skills research group (LEAPS), Elaine is currently undertaking a Professional Doctorate. Her thesis will explore her lived experience as a clinic supervisor through an autoethnographic lens. 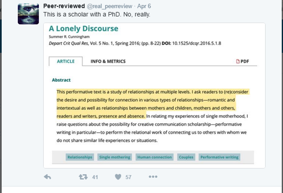 She regularly blogs<http://www.alawuntoherself.com/> and tweets (@alawuntoherself) about academic writing, research, and clinic work. In 2016, through a public vote, her blog was a finalist in the Education category of the UK Blog Awards, and The Guardian featured her as having one of the Best Social Media Accounts for Academics<https://www.theguardian.com/higher-education-network/2016/mar/23/follow-the-leaders-the-best-social-media-accounts-for-academics> to follow.